Camping is sometimes called “pretending to be poor,” so it’s no surprise we love to camp. Spending time in nature with family or friends makes for an inexpensive and highly fulfilling vacation. Yet many otherwise frugal people haven’t tapped into the incredible on-going savings of camping. So we hereby issue the Pretend to Be Poor Camping Challenge: give camping a try! Spend at least one day & night camping, in order to open the door to a lifetime of frugal, fun vacations. And if you’re thinking “you couldn’t pay me enough to go camping,” you have to read on about all the proven personal and family benefits that pricier vacations fail to deliver. A word of encouragement to non-campers: I never camped while growing up. I first ventured into the hobby as an indoorsy college student with no camping skills, came to love the experience, and have camped 3-4 times a year ever since. We even camped for a week with a two-year-old and barely-four-month-old, and had a blast. (Read about this crazy adventure in “Camping with Kids” on my mom blog.) If I can learn to like camping, so can you! And there are so many benefits for you, your relationships, and your children (if you have them). Inexpensive vacation. Camping is, of course, supremely frugal if done right. For example, we camp in Florida during spring break and spend $107 for the site for the week. We couldn’t get a hotel there for one night at that price! We camp in a tent, have used the same camping gear for over ten years, and only upgraded to a larger tent because of our growing family. With the simple investment in a camp stove (about $50 new), you can shop at a discount grocery store and cook all your meals easily that way. Or cook exclusively on the fire. Read more about our $500 week-long camping vacation here. Don’t have camping gear? There are many ways to come by it cheaply, and you don’t need a fancy camper, RV, or lots of accessories to have a good trip. Our family camping gear includes a tent, propane stove, air mattress (now that we’re “old”), sleeping bags, cheap camp chairs, and basic cooking implements. If you’re not ready to invest a lot in supplies, ask to borrow gear from a friend or family member. Check garage sales, Craigslist, and thrift stores for used items. You probably already have things like flashlights, bug spray, pots & pans, and old blankets in your home. On long trips we buy wood from Craiglist while there. A sense of accomplishment. Chillin’ in nature is also rife with intangible benefits like the deep bonding between campers, the soul-rest of time in nature, and the fulfillment of learning skills or mastering challenges. Learning to pitch a tent, build a fire, and keep your children alive while pitching a tent and building a fire, all inflate one’s sense of usefulness. While camping may not be as easy as lounging poolside, it combines leisure and accomplishment in a most delightful way. Closer families. Nothing has brought us closer as a family than the zany challenge of camping with two little kids. I know we wouldn’t feel the same sense of satisfaction returning from a resort vacation or Disney World. More than anecdotal evidence supports my closer-family camping hypothesis. Camping has been identified as a the number one predictor of family cohesiveness. It correlates with families who like each other, still spend time together even when the children are adults, and have close relationships. Camping has also been linked to better grades for school children. Ready to book a camp site yet? It’s no surprise that camping is good for kids since every family member has to contribute. (Okay, maybe not the four-month-old.) Kids learn skills like how to build a fire, roast a hot dog, hike, fish, swim, and identify plants and animals. They’re also forced to play without high-tech toys or entertainment and develop adaptability. 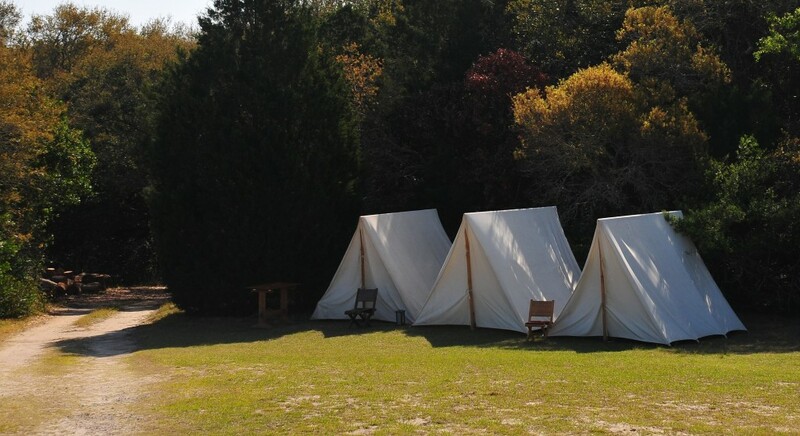 Many campgrounds offer free activities for kids, like scavenger hunts, nature walks, concerts, or dances. If you’ve ever stayed in a hotel with young children, you might imagine the advantages of camping. The kids can run around outside during the day instead of being contained to a hotel in between sight-seeing. The germ content of dirt concerns me far less than whatever lurks in hotel carpet and bedspreads. I was worried about our kids being able to sleep in a tent, but all the exercise and fresh air wears them out & they sleep great, as many camp moms will testify. I can’t emphasize how happy our kids are while camping, even as infants. Our son loves talking about past trips and cries when daddy goes backpacking without him! Let go of your standards. Camping forces us to let go of our often arbitrary rules for “civilized” life. I relish leaving behind the Internet and make-up bag for a weekend or even a week. I may have peed places other than the toilet, showered once all week, cursed in front of my toddler (about needing a shower), let the kids go barefoot all day, and helped my kid poop over a tree root. And Neil may have rinsed a poopy toddler sans swim diaper in the ocean. It’s all part of the fun if you can laugh about it. Choose your challenge. The continuum of camping options allows campers to “choose their own adventure.” From wilderness backpacking to “glamping,” pick your desired mixture of leisure vs. challenge. Pitch a tent in your backyard if you need to ease in. Our city maintains a campground less than two miles from our home, which is perfect for short trips that don’t require much planning. Check out whether your local parks have camp sites available. Or camp to save on lodging near your next sight-seeing destination. Whatever you decide, just be sure to look up at the stars, enjoy good conversation around the fire, and don’t forget the s’mores. What do you like about camping? Or what are your hang-ups? I actually haven’t done much camping – but it’s something I know we’re going to do more of when our child gets a little older (6 months now). I agree with all the benefits you described. There is something special about camping, sustainability, etc. that you can get from camping. For me, it would be a great way to get a “recharge” on life! Looking forward to it! In my opinion it’s the ultimate family activity and I find it very refreshing. Glad to hear you’re open to it! That does not sound very fun. I hope the shots help & allow you to be a happy camper! Perhaps a Southwest road trip/camping where there’s less foliage? We are on the hunt for a larger tent. We didn’t go camping with our son until this year, and we found that our so called four man tent was way to small for two adults and a pack and play. We will also be buying a new camping stove because ours is a hand me down trash find from the 1960s, which requires constant fuel pumping to maintain a flame. We’re definitely more of “campers” than campers. We prefer a well maintained campsite with modern bathroom facilities. That way we can go for hikes or to the beach and enjoy the outdoors without feeling like we are struggling to survive. Yes, we upgraded to an 8-person because the 4-person doesn’t really fit four people comfortably. We also enjoy camping with water & electric on site & nice bathrooms during our week-long trips. It is a less expensive way to sight-see and visit the ocean while not feeling like you are “roughing it” on a getaway. Frugal tip: If you’re really into camping/visiting national parks, make friends with a disabled person. Tim and I can get into most (maybe all?) national parks for free with our Medicare cards. And we can each take an extra person with us. We were told we could get free camping in a lot of places too. I’ve never been remotely interested in camping. I have a hard enough time sleeping in regular beds; I’m allergic to certain mosquitoes in a very painful way; and the fatigue makes me less than outdoorsy. Now that Tim has so much joint and muscle pain, at least I don’t have to create counter arguments to going camping. Though the idea of scorpions down here had him less than eager anyway. I can’t imagine camping would be a good time for anyone with chronic fatigue or joint pain, not to mention allergic to mosquitoes. It’s kind of ironic that you can’t make much use of that disability “perk” but do you get some use of it for daytime sightseeing in national parks? Love camping and it can be a very cheap vacation, as long as you’re not staying in a free campsite. Campsite in parks usually cost money and that cost can add up quickly. Group camping is a great option. We often pay as little as $10 for our family for a whole weekend. My family began camping last year in order to save money, and have loved it! This year we went to Montana, and California. We saw a bald eagle with a fish in its talons, and some blue whales right from our campsites. We also visited San Francisco while in CA. I guarantee we wouldn’t have had these types of experiences had we not camped. The cost for a night in a hotel is more expensive than the cost for a campsite for four or five days. And the kids have a blast as well. (Our children are 7, 4, and 2 years old). We excitedly look forward to many more camping adventures to come. Wow, those are some awesome sights! That’s great you’ve found a way to save and have fun experiences together.